Merry Christmas! I’m pleased to hear that you still have that little Nativity set & that you’re getting good use from it. 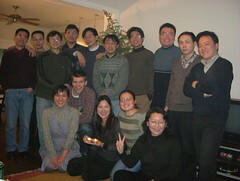 Merry Christmas to Sinosplice network and all the fellas and ladies in Shangers and Hungso. It all came so quickly… next up: 2006. Bam! Merry Christmas, John. For Christmas I want a job in Shanghai. happy kwaanza paz. for christmas i want a strapping young lad who looks good in a plain white t shirt and a graduate degree. but ill suppose ill take socks and underpants again…..
I’m strapping and i look good in underpants and socks. My graduate degree is in funkitude though. Does that count? doom, i thought you were aiming for “fat and sassy” this season….. are you sure you dont want to add the tshirt into the mix? funkitude, huh? ill funk yer tude brutha. you name the day.